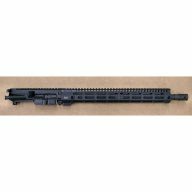 .458 SOCOM 10.5in – 1:10 Fast Twist barrel, only available in 416 Stainless – Pistol length gas system. Bolt includes the extractor, ejector, and gas rings. Standard right hand ejecting. Counter bored gas port. Muzzle threaded 5/8-24. .875″ Gas Block Journal. Stainless barrel can be ordered with black finish. (add $25). Recommended for shooting 500+ grain bullets, subsonic, suppressed. 12″ barrel and longer can use 1:14 twist.